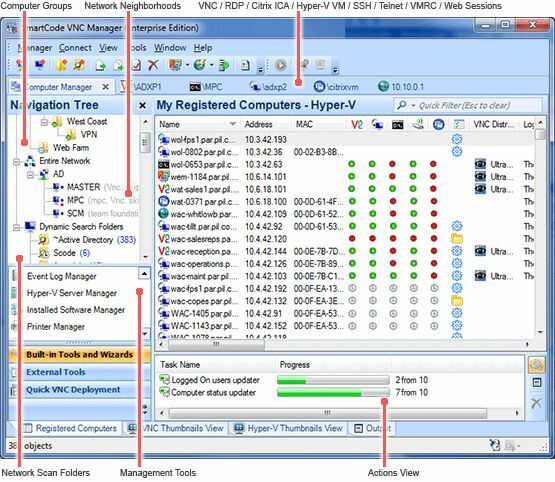 SmartCode VNC Manager is a powerful yet easy to use remote administration and monitoring software application for both the business and home network environments. It is typically used for remote network management, remote system administration and in helpdesk environments. It allows you to take remote control of any computers running VNC, Windows Terminal Servers, or Microsoft Virtual Server 2005. The product is available in two editions: Enterprise and Standard - to meet the diverse needs of IT professionals.